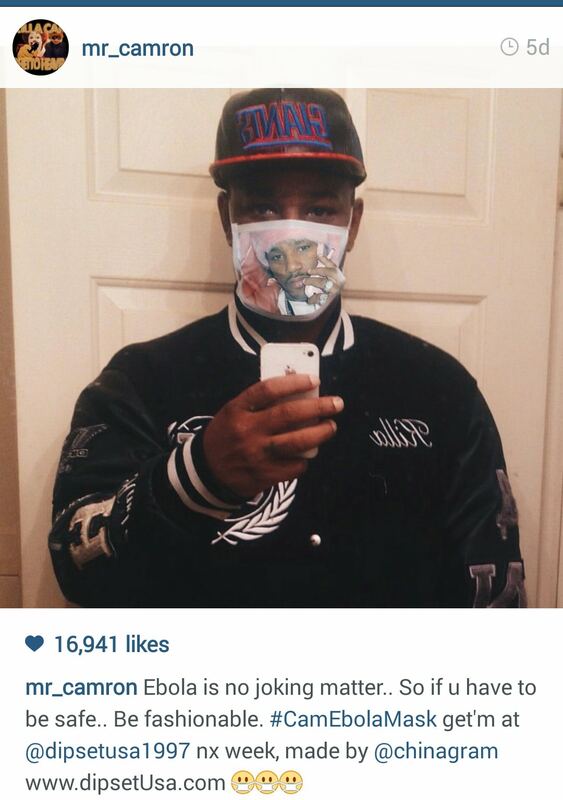 Ebola – Rapper Cam’ron has begun selling masks designed to prevent the spread of Ebola. The masks feature a close-up photo of Cam’ron talking on a pink cellphone. The “Cam’ron Ebola Mask” is available online for $19.99 and begins shipping Nov. 7. It “provides complete protection while remaining light and comfortable,” according to the product’s site. I’m a little late on this story because when you see a Cam’ron headline in 2014, you don’t exactly jump out of your seat waiting to read it. Boy was I wrong. The Cam Ebola Mask, which, and correct me if I’m wrong, looks like a regular face mask with Cam’ron’s picture on it, is here to save your life. How? I am not sure, but if there’s one person on this Earth that I believe can save me from Ebola, it’s Cam’ron. Far and away my favorite part of this whole thing is that the masks begin shipping November 7th. It’s not like Ebola is a deadly disease that’s spreading across the globe. Don’t worry about putting a rush on the shipment. Just know that if you get Ebola on or after November 7th, you’ll be OK. Until then, you’re doomed. Posted on October 21, 2014, in Average Blog Posts and tagged cam'ron, cam'ron ebola mask, dipset usa, ebola, mr_camron. Bookmark the permalink. Leave a comment.